Henry V, 16 September 1386 – 31 August 1422, also called Henry of Monmouth, was King of England from 1413 until his early death in 1422. He was the second English monarch of the House of Lancaster. Despite his relatively short reign, Henry’s outstanding military successes in the Hundred Years’ War against France, most notably in his famous victory at the Battle of Agincourt in 1415, made England one of the strongest military powers in Europe. Immortalised in the plays of Shakespeare, Henry is known and celebrated as one of the great warrior kings of medieval England. In his youth, during the reign of his father Henry IV, Henry gained military experience fighting the Welsh during the revolt of Owain Glynd?r and against the powerful aristocratic Percy family of Northumberland at the Battle of Shrewsbury. Henry acquired an increasing share in England’s government due to the king’s declining health, but disagreements between father and son led to political conflict between the two. After his father’s death in 1413, Henry assumed control of the country and asserted the pending English claim to the French throne. In 1415, Henry embarked on war with France in the ongoing Hundred Years’ War between the two nations. His military successes culminated in his famous victory at the Battle of Agincourt and saw him come close to conquering France. Taking advantage of political divisions within France, he conquered large portions of the kingdom and Normandy was occupied by the English for the first time since 1345–1360. After months of negotiation with Charles VI of France, the Treaty of Troyes recognised Henry V as regent and heir apparent to the French throne and he was subsequently married to Charles’s daughter, Catherine of Valois. Henry was born in the tower above the gatehouse of Monmouth Castle in Wales, and for that reason was sometimes called Henry of Monmouth. He was the son of Henry of Bolingbroke and Mary de Bohun, and thus also the paternal grandson of the influential John of Gaunt, and great-grandson of Edward III of England. At the time of his birth, Richard II, his first cousin once removed, was king. Henry’s grandfather, John of Gaunt, was the king’s guardian. 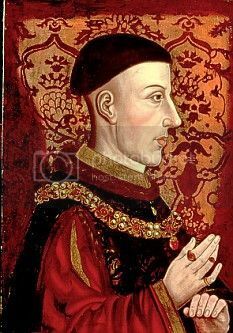 As he was not close to the line of succession to the throne, Henry’s date of birth was not officially documented; and for many years it was disputed whether he was born in 1386 or 1387. However, records indicate that his younger brother Thomas was born in the autumn of 1387 and that his parents were at Monmouth in 1386 but not in 1387. It is now accepted that he was born on 16 September 1386. After Henry IV died on 20 March 1413, Henry V succeeded him and was crowned on 9 April 1413 at Westminster Abbey. The ceremony was marked by a terrible snowstorm, but the common people were undecided as to whether it was a good or bad omen. Henry was described as having been “very tall, slim, with dark hair cropped in a ring above the ears, and clean-shaven”. His complexion was ruddy, the face lean with a prominent and pointed nose. Depending on his mood, his eyes “flashed from the mildness of a dove’s to the brilliance of a lion’s”. Baghdad falls to American forces during the Iraq war. Three weeks into the invasion of Iraq, Coalition Forces Land Component Command elements, led by the U.S. Army 3rd Infantry Division moved into Baghdad. The United States declared victory on April 14, and President George W. Bush gave his Mission Accomplished Speech on May 1. 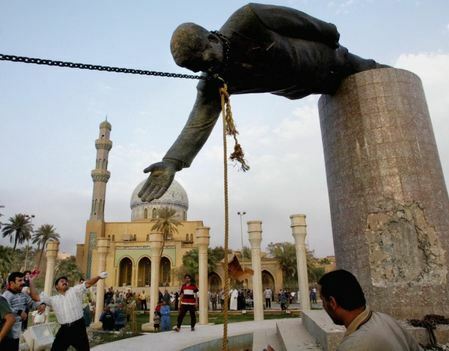 Baghdad suffered serious damage to its civilian infrastructure, economy, and cultural inheritance from the fighting, as well as looting and arson. During the invasion, the Al-Yarmouk Hospital in south Baghdad saw a steady rate of about 100 new patients an hour. Several thousand Iraqi soldiers as well as a small number of coalition forces were killed in the battle. After the fall of Baghdad, Coalition forces entered the city of Kirkuk on April 10 and Tikrit on April 15, 2003. Prior to the invasion, the US policy was that journalists reporting from the ground should be “embedded”, that is, be stationed within military units. Such reporters were required to sign contracts with the military and agree to rules that restricted what they could report on. Journalists found breaking those rules risked losing their embedded accreditation and being expelled from Iraq. Black Hawk helicopters from 5th Battalion, 101st Combat Aviation Brigade, 101st Airborne Division (Air Assault) move into an Iraqi city during an operation to occupy the city, April 5. On this day 9th April, 1413, Henry V was crowned King of England. Invading Normandy in 1415, he captured Harfleur and defeated the French at Agincourt. He invaded again in 1417–19, capturing Rouen. His military victory forced the French into the Treaty of Troyes in 1420, which gave Henry control of the French government. He married Catherine of Valois in 1420 and gained recognition as heir to the French throne by his father-in-law Charles VI, but died before him. He was succeeded by his son Henry VI. Henry was knighted aged 12 by Richard II on his Irish expedition 1399, and experienced war early. He was wounded in the face by an arrow fighting against his military tutor Harry ‘Hotspur’ at Shrewsbury. Campaigns in Wales against Owen Glendywr taught him the realities of siege warfare. He was succeeded by his son Henry VI. Henry was a cold and ruthless soldier, respected by contemporaries as a chivalric warrior. Determined to revive the war in France, his invasion of 1415 was impressively organized but his siege of Harfleur took too long, reducing his intended grand chevauchée to a reckless dash to Calais. Although his tiny, bedraggled army was cut off by a superior French force, it achieved a surprising victory at Agincourt. When Henry returned it was with serious intent to reduce Normandy, which he did, including a long, bitter siege of Rouen. Military pressure on Paris ensured the favourable Treaty of Troyes in 1420, making him heir to the French throne, but he contracted dysentery conducting the siege of Meaux. Spain and the Dutch Republic sign the Treaty of Antwerp to end the Eighty Years’ War. The Battle of Liegnitz. The Mongol forces defeat the Polish and German armies. A gunman murdered 5 people, injured 5, and then committed suicide in a shopping mall in the Netherlands.